And here it is, the first Tasty Tuesday on a Friday with Christmas Vanilla Balls! I have been meaning to share this recipe with you for a long time and decided I could not wait any longer. Today is the day. It is not Tuesday, but it is definitely tasty. I have been making these delicious balls for years. Not only for Christmas, but also for any special occasion and even on a lazy Sunday afternoon. Mildly sweet, a bit crunchy, rich, and satisfying to the taste buds. An easy delicious dessert to take to a potluck or to share with your family. You can store some in the fridge and put the rest in the freezer to enjoy later. 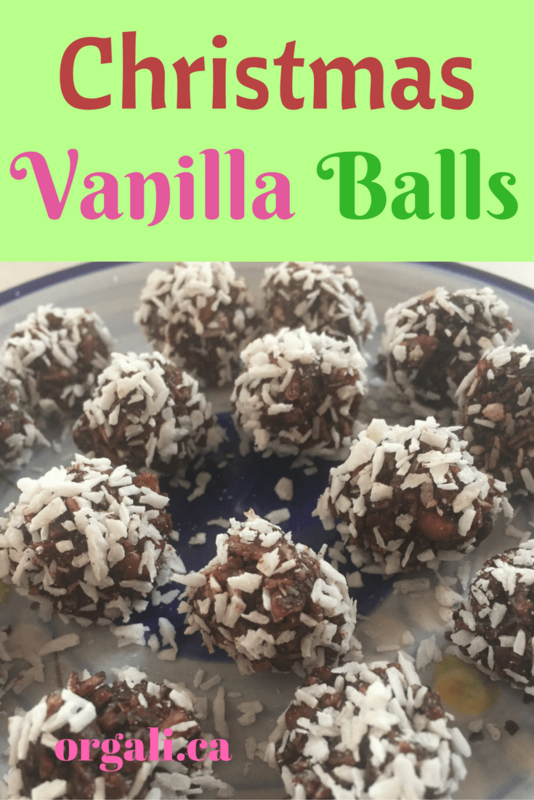 My kids love these Christmas Vanilla Balls and I am sure yours will too! Process pecans in a food processor until crumbly, not fine (smaller pieces can be seen). Process slivered almonds in a food processor until crumbly, not fine (smaller pieces can be seen). In a big bowl, mix pecans, almonds, cacao powder, shredded coconut, and cinnamon. Add coconut oil, maple syrup, and then vanilla. Mix well. Taste and add 2 more tablespoons of maple syrup if you prefer them sweeter. Place in the fridge for 30 minutes so the mixture firms up. Form balls with your fingers. The mixture is a bit sticky, but not too sticky to form the balls. Roll each ball in coconut flakes. Alternatively, you can grind the coconut flakes to make them finer and to look like sugar. Then roll the balls into this fine coconut flake powder. Makes at least 40 balls (depending on the size you want to make them). What is your family’s favourite Christmas dessert? These look delicious and super healthy! Thanks for sharing the recipe, I’ll definitely be trying them soon. I hope you like them, Emily!